"Legacy of Wyoming and The Wild West"
"Legacy of Wyoming and The Wild West"a school assembly version of the "Legacy of the Wild West". An educational curriculum based multi-media program which utilizes history, music, art, language arts, & drama covering 4.5 billion years of Wyoming and Western History in 45 minutes. This live presentation is performed utilizing fiddle, banjo, mandolin, guitar and vocals. Over 200 historical paintings and photographs secured from museums and galleries across the West are also presented. This program is based on the curriculum taught in many educational institutions and adheres to current national educational standards. "The Legacy of Wyoming and the Wild West"
Before the Westward Expansion....Music and Narration. Overland Overture...Song on Banjo/Vocals. Introduces Oregon Trail Overlanders and Pioneers. In The Beginning...Story in Traditional Indian Sign Language. Sweet Betsy from Pike...Guitar/ Vocals. Traditional, (1858). Dust....Song on guitar/vocals, about what's for dinner, lunch, breakfast, etc. 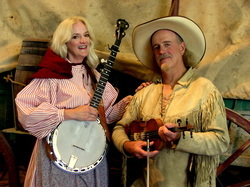 Story of the Donner Party...Vocals by "Buffalo Bill"
Clementine....Mandolin/Vocals. Gold Rush of 1848.